In 2012, there were 71 journalists killed worldwide. Syria became the deadliest place for the press with 29 journalists murdered. (1) Apart from two hot spots including Syria and the occupied Palestinian territory, journalists were killed mostly in Africa, Latin America and South Asia. In the Southeast Asia region, Cambodia and the Philippines each contributed one case. 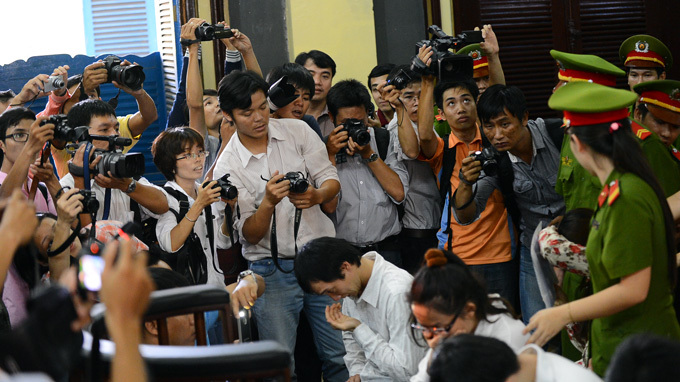 In Vietnam, on the contrary, no journalist has been murdered for their professional work. One exception which could be construed as attempted murder was the acid assault against journalist Tran Quang Thanh on July 4, 1991, leaving him disfigured and handicapped. Days before the attack he had received death threats from an anonymous gang, about which he told the Nguoi Viet in 2011, “only the police knew and revealed to the gang that I was the informant.” Notably no local newspaper reported anything about his story, which subsequently fell into oblivion. Despite this attack, Vietnam was not featured in the list of deadliest countries to be a journalist. In other words, Vietnam does not control the media by killing journalists. This may tempt western observers, when discussing free media, to think that no matter what has been said and done, Vietnam still has a free press, with its journalists protected in a safe environment. Ironically, the good news also implies another aspect worth considering. That is to say, armed conflict and civil war excluded, the fact that journalists get killed in some countries indicates that those countries have independent media with investigative and anti-corruption journalism. Meanwhile in Vietnam, there has not yet any murder of journalist. This may be explained by the fact that the press in Vietnam is under strict state control; the press is not at all independent and investigative, there is nothing close to anti-corruption journalism. Put simply, Vietnamese journalists in general are not allowed to do work that is worth being killed for. Too obedient to be killed, they are not influential enough. The press will never find any statement in written form about the policy of the VCP toward its Chinese counterpart. Nor will they find any specific document clearly stating the direction of media controlling in this area. So the public just can guess and spread rumors that the China-Vietnam relations is perhaps a highly sensitive issue. This sensitivity was demonstrated by many of the arrests of and sanctions against bloggers and journalists between 2007 and 2013 involved Chinese elements. August – September 2009: Several bloggers were detained and accused of “violating national security” by getting involved in a plan to produce T-shirts opposing China’s bauxite mining project in Vietnam. That is not to mention hundreds of private phone calls and text messages to single media agencies, reporters, and editors. They were made to instruct and to “guide” the press during the pre-publishing process, and to give warnings and complaints after that. Ironically, any journalist can be confident that the Vietnam-China relations is actually a topic of much public concern. The tactics they adopt to court audience are quite simple: shocking titles, anecdotes, unverifiable and misleading information are all accepted. It is especially advisable to interview those with a strong anti-China mind, even nationalists. The result is poor journalistic works, as there remains to be, and, most importantly, more excuses for the government to hold its grip on the press, especially in relation to “propaganda activities” about the South China Sea issue. A fallacy usually committed by the VCP’s “rumormongers” (3), or public opinion shapers, is that “if one really cares about something, one will surely try to learn about it, thus become informed.” That is to say, if one is concerned enough about the Vietnam-China relations, one must try to learn about it oneself. As a result, transparency – or the state obligation of keeping the citizens informed of public policy – has become a mind game for the people, including the press. Furthermore, with the Vietnamese style of press freedom, there are numerous sources that are inaccessible even to mainstream media, let alone citizen journalists. Can any blogger ever attain such information? (1) Committee to Protect Journalists (CPJ), 2012. (2) The maritime sovereignty dispute between Vietnam and China has loomed over all suppressive acts by the Vietnamese government against their people in recent years: the Vietnamese Communist Party appears to face a dilemma of either taking the side of their nationalist citizens or maintaining the “comradeship” with their Chinese counterpart. At times they seem to appease the assertive China even when this means an attack on media freedom: dozens of anti-China bloggers and street protestors have been arrested in recent years. (3) On January 9, 2013, Head of the Hanoi Party Committee’s Propaganda Department, Ho Quang Loi, in a meeting to review the press’ activities in 2012, said Hanoi must be the “focal site of reactionaries” during the year. He said the propaganda measurements were that the Department had set up a force of 900 “rumormongers” (ie. those who make up rumors) across the city “to fully exploit the power of propagandists.” At the same time, the City’s press, “in obedience to the orders from the superiors in dealing with sensitive cases”, has founded teams of “button-pressing, rapid response journalists”.